Sears Home Improvement Products (SHIP) was a division of Sears that specializes in home improvement solutions. Sold to service.com in 2018. 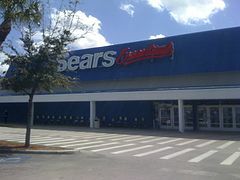 A&E Factory Service (Sears Home Services) was the newest name for Sears' longstanding on-site repair service, servicing larger items such as home appliances, electronics, and garden equipment. The A&E brand name was purchased from Montgomery Ward, which used it for their home service unit, and is a joint venture held by Whirlpool and Sears Holdings. A&E Factory Service is a network of mobile service vans with a long history of performing appliance repairs. Sold to service.com in 2018. ^ a b Sears Holdings Corporation (2016). 2016 Form 10-K, Sears Holding Corporation (pdf) (Report). United States Securities and Exchange Commission. p. 41. Retrieved 4 November 2017. ^ "2017 Top 100 Retailers". STORES.org. Retrieved 4 November 2017. ^ a b Kapner, Suzanne; Rizzo, Lillian (2019-01-16). "Sears to Stay Open, After Edward Lampert Prevails in Bankruptcy Auction". Wall Street Journal. ISSN 0099-9660. Retrieved 2019-01-16. 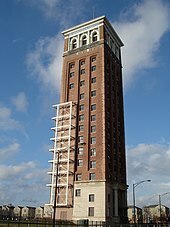 ^ "Julius Rosenwald Pledges $20,000,000 For Sears-Roebuck". New York Times. December 30, 1921. Retrieved January 6, 2017 – via ProQuest. (Subscription required (help)). ^ Passikoff, Robert. "A Love Song To Mr. Sears & Mr. Roebuck, Who Could Use One About Now". Forbes. Retrieved 2018-11-28. ^ Farzan, Antonia Noori. "How Sears mail-order catalogs undermined Jim Crow racism". Chicago Tribune. Washington Post. Retrieved 19 October 2018. 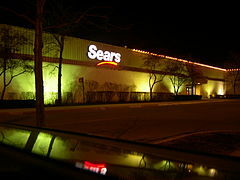 ^ "Who Killed Sears? 50 Years on the Road to Ruin". Investopedia. 3 November 2017. Retrieved 4 November 2017. ^ Naidu, Richa (7 Jul 2017). "Sears to close 43 more stores to cut costs". Reuters. Retrieved 9 July 2017. ^ Stych, Ed (October 25, 2017). "Sears splits with Whirlpool appliances, splintering 101-year relationship". Dayton Business Journal. Retrieved 5 January 2018. ^ Thomas, Lauren (28 December 2018). "Sears closing 80 more stores in March as it faces possible liquidation". www.cnbc.com. Retrieved 29 December 2018. ^ Isidore, Chris. "Sears moves to sell Kenmore". CNNMoney. Retrieved 2018-08-22. ^ DiNapoli, Jessica. "RPT-FOCUS-In Kenmore sale, Sears' pension liabilities come back to..." U.S. Retrieved 2018-08-22. ^ Sputnik. "US Retail Giant Sears Files for Bankruptcy, Blames E-Commerce for Failings". sputniknews.com. Retrieved 2018-10-16. ^ Hirsch, Lauren Thomas, Lauren (2018-11-08). "Sears to shut 40 more stores early next year". CNBC. Retrieved 2018-11-08. ^ Researcher, WYCO (2018-11-23). 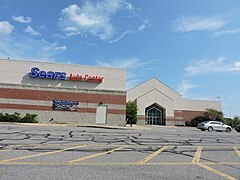 "List Of Sears Stores To Be Sold And Other Bankruptcy Developments". Seeking Alpha. Retrieved 2018-11-24. ^ "Sears gets to stay in business: Bankruptcy judge OKs Eddie Lampert's plan". Los Angeles Times. February 2018. Retrieved 7 February 2018. 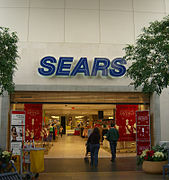 ^ "Sears opening stores for a change". Retail Dive. Retrieved 2019-04-04. 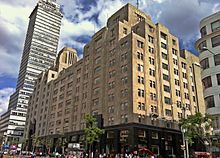 ^ "Profile: Sears Holdings Corp". Retrieved 2017-06-02. ^ "Form 10-Q for the quarter ending July 29, 2017 – Sears Holdings Corporation". U.S. Securities and Exchange Commission. Retrieved 4 November 2017. ^ "New Sears Outlet Store Opens in Queens Village". 2015-05-26. Retrieved 2015-06-03. ^ "Lands' End | About Us". www.landsend.com. Retrieved 2018-10-15. ^ "Lands' End Opens First Standalone Store in New Jersey | Lands' End, Inc". Lands' End, Inc. Retrieved 2018-10-15. ^ Corporation, Sears Holdings. "Sears Holdings Seeks Court Approval Of Stalking Horse Asset Purchase Agreement With Service.com To Sell Sears Home Improvement Business". www.prnewswire.com. Retrieved 2018-12-08. ^ Sears Holdings (October 4, 2000). "California Ready to Discover The Great Indoors" (Press release). Retrieved 3 January 2018. ^ "Coldspot: 1928-1976". Sears Archives. Sears Brands. Retrieved 31 July 2011.